Jerusalem (AsiaNews) - Jews and Catholics must witness to "the Divine Presence in our world" and "The Divine Image in every human being" to correct the irreligious inconsistency of modern secularism, which slips into nihilism and barbarism, absolutizing 'individual rights and forgetting "the common good”. 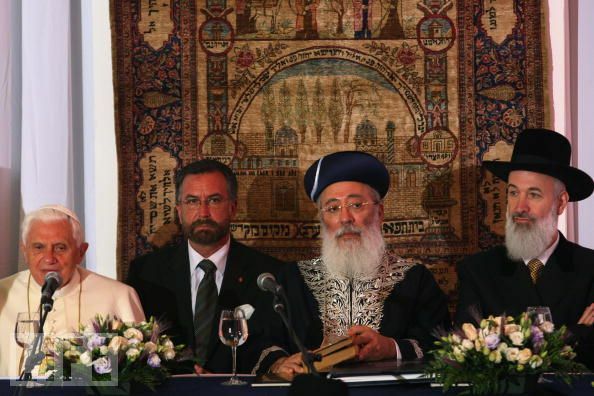 So say the representatives of the Holy See and the Chief Rabbinate of Israel in a joint statement issued today. Released by the Vatican press office, it summarizes the contents of the meeting held in Jerusalem March 29 to 31 between the two delegations led by Card. Jorge Mejia and Chief Rabbi Shear Yashuv Cohen. The two delegations (which constitute the bilateral commission) are at their 10th meeting bent on tackling "the challenges of faith and religious authority in secular society." In the declaration, they state that "secular society", despite some "benefits", has created a "moral crisis". And this is due to "rapid technological advancement, rampant consumerism, and a nihilistic ideology with an exaggerated focus on the individual at the expense of the community." While not forgetting some positive values of empowerment, "the last century - it claims - has witnessed unparalleled violence and barbarity. Our modern world is substantially bereft of a sense of belonging, meaning and purpose". If secular society wants to maintain the values it has produced (a large commitment of society; civil rights of individuals), it must be rooted in a "it needs to be rooted in a higher anthropological and spiritual framework that takes into account “the common good”, which finds its expression in the religious foundation of moral duties. Society’s affirmation of such human duties, serves to empower and enshrine the human rights of its constituents." The two delegations confess "past failures in being true witnesses" and stress the importance of religious leaders and the faithful to "offer hope and moral guidance," which derives from "consciousness of the Divine Presence [in the world] and Divine Image in every human being”. The means to strengthen this testimony are prayer and reading the Word of God. Such testimony is also to be seen in education, focus on youth and effective engagement of the media. Similarly, in the establishment and operation of charitable institutions with special care for the vulnerable, sick and marginalized, in the spirit of ‘tikkun olam’ (healing the world). In addition, the religious commitment to justice and peace also requires an engagement between religious leadership and the institutions of civil law. In this regard, the bilateral commission has "expressed the hope that the outstanding matters in the negotiations between the Holy See and the State of Israel would soon be resolved, and bilateral agreements speedily ratified for the benefit of both communities." For Catholics in Israel this last statement is certainly the most important. Catholic circles in Jerusalem, tell AsiaNews that it is this part of the declaration has a high priority for them. Other Catholics, of Palestinian origin, look with interest at the emphasis on human rights, justice and peace. They hope that this a prelude to a major support to protect their rights by the Rabbinate, especially in the Occupied Territories, in front of the expropriation and occupation of land by Israeli settlers.